With the sun bearing down on us almost every day, proper hydration and a little bit of shade can go a long way toward making life more tolerable. That's actually why a lot of people have considered putting shades of some kind in their patios. By that we mean more than just a large umbrella by the table and patio set. There are great things that can be done with canopies and pergolas, adding a charm to the backyard while also being purely functional. These patio elements can be hard to develop and create on your own. That is why turning to landscape design and backyard concept experts like us is so essential to making your project successful. Previously on the blog we've talked about different ways that you can entertain guests in your backyard. Lunches, dinners, barbeques, or even just nice afternoons together can be great. It's important, though, to think about their comfort. That means more than just the right kinds of outdoor furniture. Giving your guests an opportunity to get out of the sun keeps the party outdoors and keeps the guests happy. Even when you're not entertaining others, it's nice to have some shade out in the back just to relax or to read in peace. And it's always great when you can add additional character to your home through something that's also functional. All the elements in your backyard have a way of complementing each other, as well as the overall design of your home. Our hardscape design team will be able to help you take various ideas into account and also help you refine your concept to meet your needs. Everyone's backyard or home is different, and so each shade element needs to be considered on that basis. Some people prefer to have a fixed shade structure of some kind, while others like having a retractable shade structure, usually with a fabric or canvas overhang. It's important to keep these considerations in mind, as well as how the shade will integrate with the other patio elements you currently have or plan to add in the future. As we've mentioned before, we offer all of our clients years of experience, as well as a solid eye for design. We will use our expertise to help you craft the best shade element that fits with your backyard. We have a strong understanding of materials and color complements, and we will help turn your concept into a reality while maximizing the available space in order to enhance the overall look of the yard. 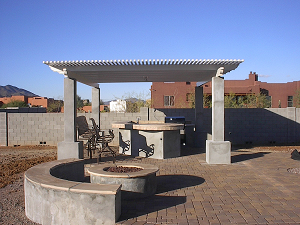 If you would like to learn more about all of your options for shades and other great additions to your patio, be sure to contact our Arizona landscape / hardscape design center today. We look forward to looking into your design concept and helping you make it a reality.